"I wonder if I would have dared think of this adventure if I knew how complex it would be." In 1970, world-class Japanese skier Yuichiro Miura set out on a journey to ski down the face of Mount Everest. With a group of 800 Nepalese porters, 27 tons of equipment and a Panavision film crew, Miura began the long hike to the base of the great mountain�something that isn't done today, thanks to a small airstrip that climbers now fly to�and then the dangerous ascent to its peak. The Man Who Skied Down Everest, winner of the Academy Award for best documentary in 1975, captures the arduous trek, mixing narration (read by Douglas Rain) based on Miura's diary amidst scenes of harsh panoramic beauty. It is the visual scope of The Man Who Skied Down Everest that is its strength, and not Miura's seemingly mad plan to risk life and limb to slide down a sheet of rocky ice at the top of the world. The rocks and snow of Everest look like an alien landscape, and the fragility of man is accented by the long camera shots showing the tiny specks of the climbers slowly making their way up the everchanging icefall, where cave-ins and deep crevasses are a constant threat, even more so than the brutal weather, which drops 100 degrees at night. Miura's diary talks of respecting "the Mother Goddess of the world", though Everest certainly does what it can to cast off the human intruders, making it one of the most treacherous places on Earth. I don't have a climber's mind set, that whole "because it's there" mentality, and watching these men pick and claw their way across sheer ice faces seems nothing short of insanity, as does Miura's grand plan to race 7,000 feet down its slope in an act that mixes seconds of pleasure with what was probably one hell of an adrenaline rush. If you want to have any of the actual drama ruined for you, just read Image's backcover blurb, which essentially describes the entire film, eliminating the need to actually watch it. Miura's actual ski run is what the The Man Who Skied Down Everest builds to, though in hindsight it is almost an anti-climax, as the quest became stained with human death, making this questionable act of extreme sporting seem sadly pointless. Image Transfer Review: The Man Who Skied Down Everest comes from Image in a 2.35:1 anamorphic widescreen transfer. A small number of age-related issues are evident, most notably a lack of vibrancy in the colors, as well as some moments of flickering. Depth and clarity are somewhat soft at times, while other scenes seem to provide more detail, but this may have been a result of the conditions under which this was filmed, as opposed to the transfer process. Audio Transfer Review: Audio has been issued in mono (English, French or Spanish), and with the majority of the film consisting of voiceover narration the presentation is fine, though a bit flat. In these days of fancy home theater setups, the scenic majesty of Everest found here almost seems to demand a more robust mix than the original mono provides. Extras Review: The only extra here is a brief automated Stills Gallery (01m:15s), containing 15 assorted images related to Miura's ascent and downhill run. The disc is cut into 18 chapters. 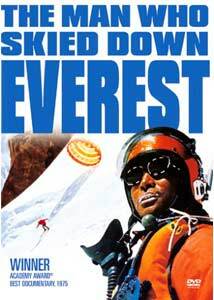 As the title indicates, The Man Who Skied Down Everest documents either an attempt to do what some might consider heroically extreme or that others might call ridiculously unnecessary. Either way, it's a beautiful looking film filled with stunning scenery and constant dangers, all leading to the moment of truth for skier Yuichiro Miura 350 meters from the peak of Everest.